Throughout the year, we invite private individuals and professionals to our workshop in the 1st arrondissement of Paris to take part in our floral art classes for all levels, run by Vertumne founder Clarisse Béraud. In tribute to the Land of the Rising Sun, Clarisse Béraud will take you on a journey across her beloved archipelago. 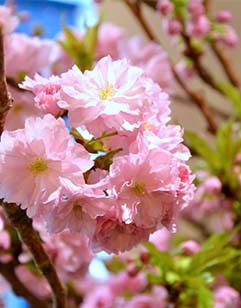 Learn about the incredible species found in Japan, while making a bouquet of sakura (Japanese cherry). Looking for the perfect gift for a plant and floral enthusiast? Innovate in the art of offering, giving the freedom to choose! We offer you our «Vertumne Gift Card», valid for 1 year from the date of pourchase. The beneficiary can participate in one of our courses in floral art (collective or private), taught by Clarisse BERAUD, or in all the services and products of our Boutique Maison Vertumne. 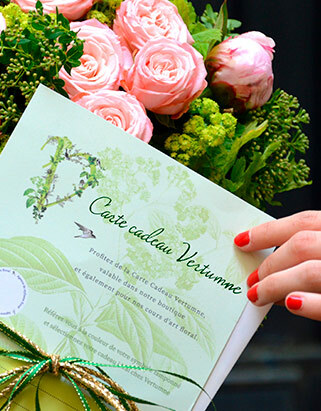 *The Vertumne gift card is valid only in our space, at 12 rue de la Sourdière 75001 Paris. It is exchangeable only for articles or services of the Maison Vertumne. Each trainee will have at his disposal the plants and flowers as well as the tools necessary for their creation. At the end of the course, each of them will leave with its composition and a certificate of participation. Our workshop can accommodate up to 6 people per course. To validate your registration to one of our courses, a deposit of 30% of the amount of your order will be required. 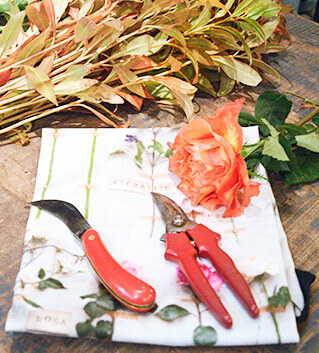 The handling of plants and florist tools means that the trainee is up to date with his anti-tetanus vaccine. Are you looking for the ideal gift for a loved one attracted by the plant and floral world? We offer an elegant gift card, designed like a precious trinket box. Our card is valid for one year from its purchase date. It is available in our shop and we can also send it to you by postal mail on request. For more information, contact us.